Welcome to our Redbird Mathematics sampling experience! Redbird Mathematics provides students with a richly personalized learning path, delivering precisely what each individual needs to build strong algebra readiness skills and accelerate learning forward. Take an interactive, hands-on tour using the Student Demo. Experience the interactive instruction, practice item sets, digital manipulatives, skill-based games, and real-world STEM connections just as your students would. This tour highlights examples from a 4th grade unit. After taking the hands-on tour, we invite you to interact with specific program features at the grade level of your choice. 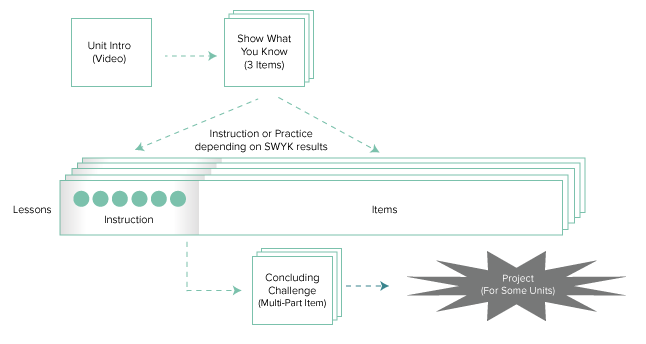 Finally, check out an overview of the data-driven reporting available within Redbird Mathematics. Explore these links to gain a better understanding of Redbird Mathematics Unit components, instructional model, and digital STEM projects. 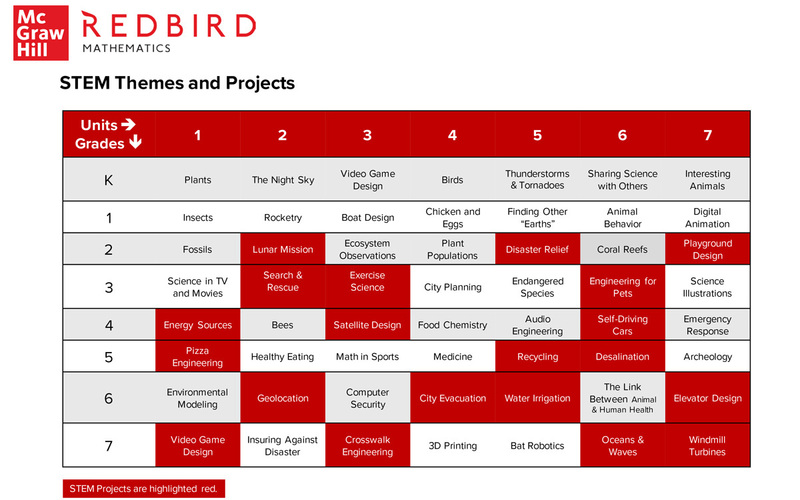 Each unit of Redbird Mathematics is embedded in a STEM (Science, Technology, Engineering, Mathematics) theme. Select units, highlighted red, conclude with a digital project-based learning experience focused on the unit’s theme. Introduction to the topic to engage students with videos providing background information and career connections. Math Tasks where students explore mathematical constraints for the problem and showcase their math proficiency. Solution Creation using design, coding, or simulation tools to solve the STEM problem. Concluding Activities including challenges, extensions, and feedback about the project. District-level reports help administrators easily see how often the program is being used and how schools within the district are performing. While Redbird Mathematics offers a robust suite of reporting capabilities, these are the key reports you won’t want to miss. Shows student progress and proficiency against Common Core State Standards* at the class level. This report helps teachers pinpoint where individuals or groups of students may be struggling or progressing giving them the opportunity to provide the appropriate support or encouragement where students need it most. *Select state-specific standards proficiency reports are also available. Provides a detailed report including time spent on task, correct first attempts, lesson pace, lesson location, and activity breakdown. These key metrics help teachers determine how well students are progressing and identify which students need teacher attention. 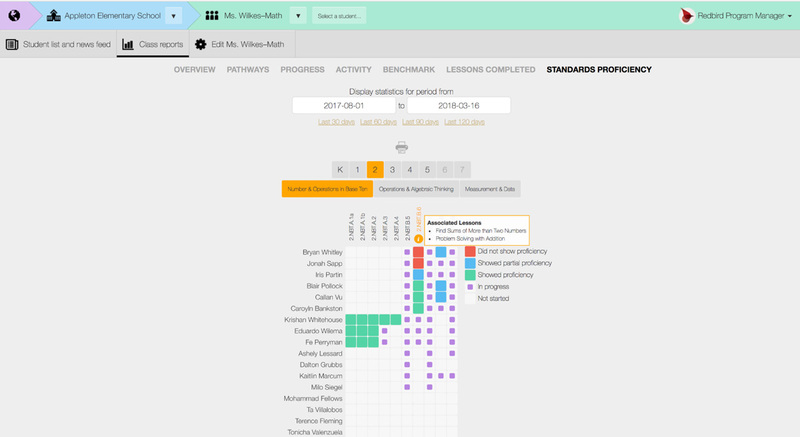 Real-time updates on student activity and progress including when students struggle and when they soar—filtered by Positive, Alert and Session Info. Sequence of every attempt at a skill, including a heat map showing student progress by calendar day. Enables teachers to review progress, discuss understandings, and improve effective use of Redbird. Keystroke-by keystroke replay of every student action including instruction and open ended responses. 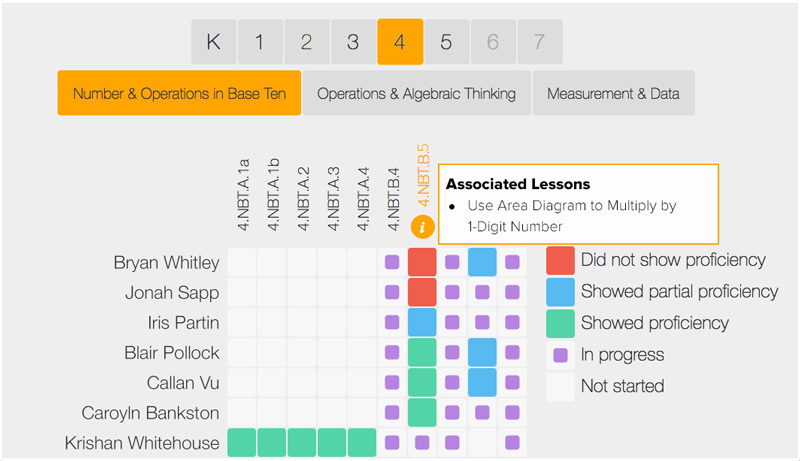 Enables teachers to review and discuss areas where a student struggles. NOTE: The District Benchmark report is visible only to administrator-level Redbird accounts.